I am sure that the design team at Vermont Castings which came up with the fall-away stove handle was soundly congratulated for coming up with a safer design that saved the company money. Their “brilliant” design innovation was to remove those cumbersome and useful stove handles and replace them with useless stubs that could be operated only with a separate handle that has to be stored safely away between each use. Opening and closing hot stove doors is now a juggling trick involving a log of wood, a hot handle stub, and a separate handle which has to be stuck in a tiny hole between every movement of the stove doors. What used to be a simple three-step operation has now become a ten-step operation. 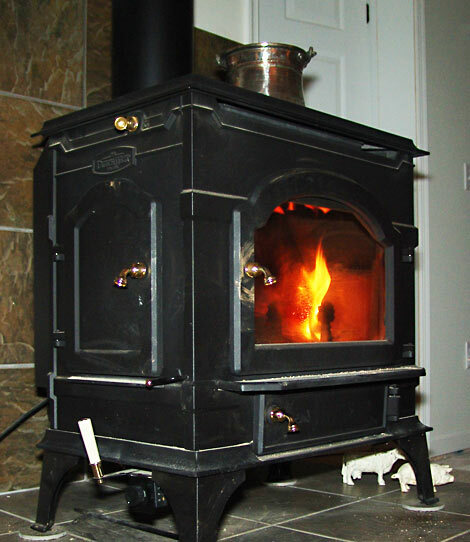 With traditional wood or wire stove handles, you approach the stove with a log in your hands, crank the handle to open the door, put the wood in the stove, and crank the handle to shut the door. No big deal for those with opposable thumbs and a modicum of intelligence. Put the handle away in the little holder way off at the left of the stove. Resist the urge to hurl the fall-away handle into the wastebasket. 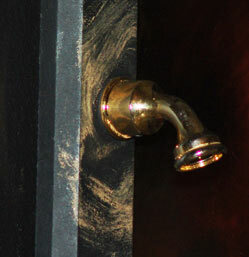 This is what happens when a fall-away handle falls onto a tile hearth. Notice the big chip out of the top right side. I asked my local stove dealer if I could get the old kind of handles as a replacement for these useless fall-away handles. He told me that all the stove manufacturers were switching to the new handles and that they were much better than the old ones. I looked around his showroom which has many operational wood stoves and saw that every one of them had the old, useful handles. I told him he might feel differently about the new handles once he starts using them. It does not seem as if anyone did much testing of these new handles under conditions of real use. I have sent an email to Vermont Castings mentioning this article since they do not provide any means to provide product feedback on their site. It will be interesting to see what their response will be. My hope is that some enterprising shop will figure out a way to make coiled wire handles that can be attached to the handle stubs that jut out from this wood stove. Then this stove and others like it will be much easier and safer to use. What happens now is that I often find myself grabbing the stub with a gloved hand and twisting it because the fall-away handle is inconveniently out of reach. When my glove is dirty, it leaves the smudges you see in the photo on the right. I also find myself putting the fall-away handle down on the hearth tiles between actions because I am holding a heavy log in my other hand and poking a handle into a holder is awkward and inconvenient. Buying extra fall-away handles and epoxying them in place is not a workable solution, as one researcher found out. The fall-away handles are ceramic and quickly get hot if they remain attached to the handle stubs which stick out of the door. I am looking for a replacement for these fall-away stove handles. If you have any information on possible solutions, I will be glad to test them and publicize the results. If I cannot find them, I will design some myself. UPDATE: I designed a set of do-it-yourself replacement handles that you can make yourself. For a second act, consider epoxying turned wooden handles to the stubs. Or showing the fall-away handle to a local blacksmith or metal-working shop, and have them make you a batch of the spiralling wire ones. I just found this site, because my husband just broke our “lovely” ceramic handle. What a piece of crap. Hopefully, someone finds a cheaper solution, because having something custom made by a blacksmith/carpenter would be more costly than the damn stove. Anyway, I agree with your detailed description of using the handles as we have the same stove, same problem. Let me know if you find anything out!! 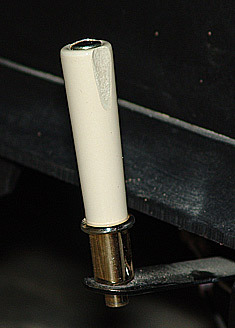 Yep, just installed a new VC Madison and received a cracked ceramic handle with the stove. It is taped until I can buy another. I have the same problem. I broke the fall-away handle the first time I used the stove. I was closing the damper, lost the grip and the handle was propelled against the back wall. I now have duct tape holding it togather. I don’t think you need to attached something to these fall-away handles. It seem someone out there should have a part to replace the whole handle. Perhaps you could get teh salesman to just trade you for some of those old style handles (since he likes the new ones so much). Wow! I’ve been looking all over the internet just to find a new ceramic cover for the fall away stove handle. I’m more frustrated with the fact that the item breaks when it “falls away”. I can usually superglue it when it breaks, but eventually it shatters enough that I end up loosing pieces. We’ve gone through two of the ceramic covers already, and I’m surprised to find that I can’t locate one online. We should all be writing to OSHA about the hazards of these handles. Just wrote to the company, but plan to contact OSHA.gov too.